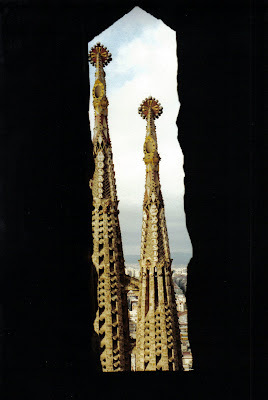 I was first introduced to Antonio Gaudi in my History of Architecture class when I was studying Interior Design. His work belonged primarily to the Modernist style (Art Nouveau) and Gaudi was famous for his unique and highly individualistic designs. I LOVED the undulating, organic curves in his work, the use of mosaics and the highly decorative style of his designs. 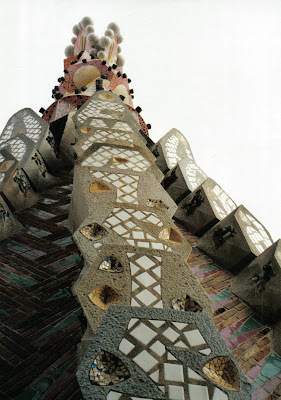 My Dad had recently been to Spain on holiday (and bought me a book on Gaudi as a gift)……he told me of seeing his work – I had to see it for myself. Years later – off I went to spend 7 weeks traveling the entire Spanish countryside. What an adventure! My favourite part of the trip would have to be the two weeks I spent in Barcelona – what a fantastic city and of course everywhere you look is Gaudi’s work. I was in heaven. Two highlights I remember most are taking the photos above from the top of one of the towers at Sagrada Familia - the detail of the mosaic work is astounding considering that they are 170 metres high! And the hot summer night when I went to a Flamenco concert on the roof top of Casa Mila (La Pedrera) and sipped champagne and gazed across the city’s rooftops. The vibe was incredible. What an amazing man. Oh, I am so jealous that you have been. I really want to go there. My niece went there last year, then my brother & his wife a couple of months later...it is on list of desirables.